“Concrete Plants of the Future” will focus on how National Ready Mix and Superior Concrete are approaching urban market demand fueled by residential development for apartment and condominium dwellers drawn to city living, especially in transit-friendly, downtown areas or bordering neighborhoods. Presenters will weigh in on best design practices for safe, efficient ready mixed production, particularly when real estate is at a premium. Confined to a two-acre parcel, Superior Concrete built a fully new plant in a tired industrial zone, Buzzard Point, now valued for its waterfront. The producer incurred considerable expense to ensure plant harmony with an up and coming urban neighborhood. It might be the last business to land a permit for a Buzzard Point industrial facility, as future building activity skews to low- and mid-rise residential and commercial development. For the near term, the very active District of Columbia construction market plays to Superior Concrete competencies in high performance mixes, plus those heavy in supplementary cementitious materials and contributing to a project’s LEED certification. Premium sand & gravel from Vancouver, B.C.-based Polaris Materials Corp., a Superior Concrete sister business unit under U.S. 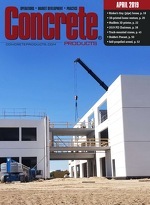 Concrete Inc., factors in the eight-figure National Ready Mix Vernon plant (“LA Legacy,” pages 60-65). At 400-yd./hour capacity, with nearly 7,000 tons of live cement and aggregate storage on a site shy of five acres, Vernon is appropriately dubbed a legacy plant: A fixed operation of great scale and potential surfacing once every few decades. Legacy ready mixed plants that most quickly come to mind are Boston Sand & Gravel’s Charlestown and Chicago’s Prairie Material Yard 32. The Vernon plant continues their model of material storage, transfer and recovery on a land-locked site near a downtown area. National Ready Mix has configured aggregate bunkers or bins and cement silos for voluminous output of high performance concrete, whose engineering properties specific to seismic and wind loads have caught the eye of Los Angeles Department of Buildings and Safety. Los Angeles lags New York and Chicago, leading markets in HPC adoption, but will gain ground in the next five years thanks to one of the value-added aspects at Vernon: Orca aggregate, sourced from a Polaris Materials glacial deposit and imported through California subsidiary Eagle Rock Aggregates Inc. Orca sand & gravel exhibits nearly unparalleled ability to impart strength development and modulus of elasticity in structural concrete. As shown in this month’s “Stiff Competition” report (page 66), the aggregate’s availability in southern California is helping rewrite the competitive position of reinforced concrete in mid- and high-rise buildings, especially those pegged for downtown Los Angeles. Orca aggregate arrived in the Los Angeles Basin four years ago through an Eagle Rock Port of Long Beach terminal. The facility recently secured a second permit doubling potential throughput to 2 million tons annually, and proving the market potential of HPC advanced by savvy producers, structural engineers and concrete contractors.